Pillow's Funtrackers is the premier family fun center in New Mexico. We have been providing fun to thousands of families for over twenty years. Our park includes three Gokart Tracks, 18 hole Miniature Golf, arcade, and seasonal attractions such as Bumper Boats, Mountain Maze,& Panning for Gemstones. We are open from Memorial Day weekend to Labor Day weekend, seven days a week. We are also open Spring Break, Easter, weekends, and Christmas Break. We are CLOSED the first weekend in December. 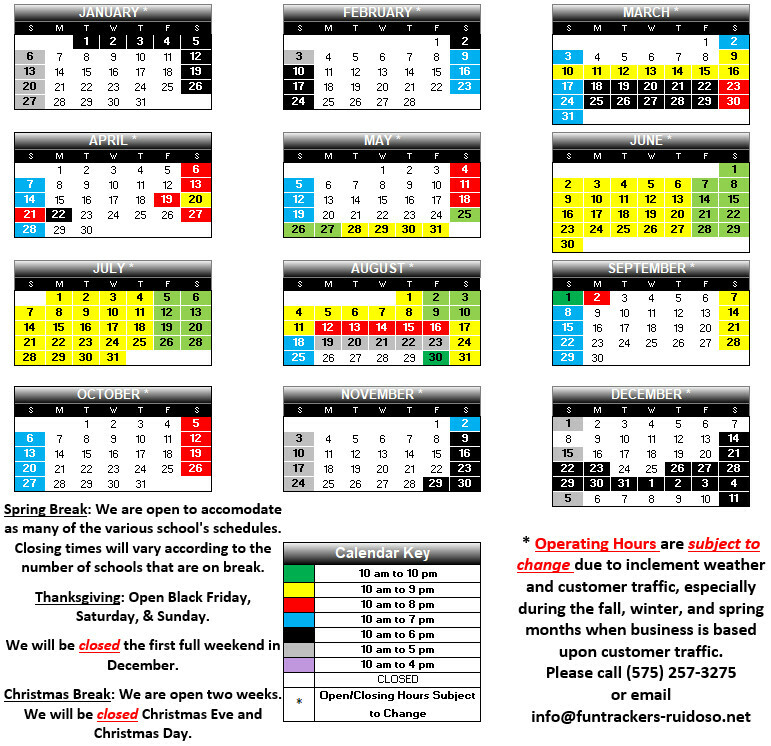 Look below for the the next few month's open schedule and hours of operation. Whenever your travels bring you to Ruidoso, stop by for a lot of fun. Tickets are required per person, per ride. All tickets can be purchased at the ticket office, located on the East side of the parking lot. *Seasonal Attractions: These attractions are open from Spring Break until the beginning of Winter. Looking for a ticket package?! Discount Tickets are available. You must purchase $100 which gives you 20 tickets that are good for ANY open attraction. This lowers the individual ticket price to $5.00. These tickets are non-refundable due to weather and good for three days during the summer, Christmas Break, & Spring Break, or the weekend of purchase during Fall, Winter, and Spring weekends (Saturdays & Sundays). We are open from Memorial Day weekend to Labor Day weekend, seven days a week. We are also open Spring Break, weekends (Sat & Sun), and Christmas Break. We are CLOSED the first full weekend in December. Check back here, call 575-257-3275, or e-mail [email protected] for up to date information. (Subject to Change. Closing hours may vary due to weather & traffic, especially during fall, winter, and spring months.